We were sorry to learn of the passing on 14 February of this long time and very loyal Auckland member, at the age of 90. 4 branch members attended the funeral and his family spoke of his long time interest in short wave listening. 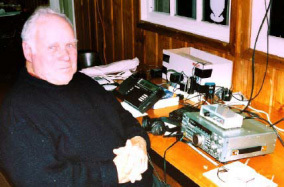 BARRY WILLIAMS writes that Jim regularly attended branch meetings, DXpeditions and DX conventions in the Auckland area. His passion was experimenting with antennas and tuners. He always donated items for our branch auctions and usually went home with as much as he had donated. Jim didn’t chase QSLs but was one of our most enthusiastic members from the time he joined Auckland branch in 1970.